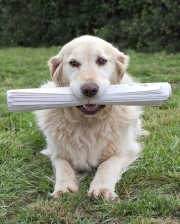 We encourage the media to contact us regarding stories on canine health research and canine health in general. Sign up to join our media list! Please help us raise awareness within your community by playing the attached broadcast-quality PSAs frequently. For reprints, logos, or other content requests please contact us. Media inquiries should be directed to chf@akcchf.org or by calling 1-888-682-9696.